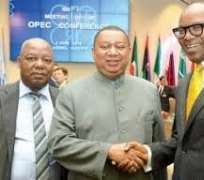 Secretary-General of the Organisation of Petroleum Exporting Countries, (OPEC), Mr. Mohammed Barkindo, on Monday, stated that the worst days for Nigeria due to the low price of crude oil were over. He said Nigeria's ability to weather the storms of the low price of crude oil was a miracle. Speaking during a courtesy visit to the Minister of State for Petroleum Resources, Dr. Ibe Kachikwu, Barkindo said confidence was returning to the Nigerian petroleum industry, due largely to the major macro-economic decisions taken last year by OPEC and non-OPEC member countries. He said: 'We have gone through the worst energy cycle in recent memory. Some of us, who have been around for a quite a while, have witnessed all these five cycles and it is a consensus in terms of the gravity of these cycles, prices have crashed by over 80 per cent from the fall of 2014 to January 2016. 'How you survived as a government as an institution under this great industry remains a miracle. I have visited all other countries and I have seen how they are struggling. Barkindo commended the giant strides the country has made within this troubling period in the global petroleum industry. 'I have been visiting many countries over this period, and I have seen first-hand how they have been struggling. However, here, I think probably we have not sold our achievements effectively, widely and efficiently,' he noted. He applauded the effort of the country in addressing the lingering issue of Joint Venture Cash Call, stating that over the years, previous administrations had battled to address the issues without success. 'Many of my colleagues that we served together would testify that government after government, we had battled with this issue continuously without solutions. 'But the day I got the information that you have been able to overcome this issue that has beleaguered this industry as well as government, I think you made my day and those of participants in the industry who know the battle of previous governments over the issue. He lamented that due to the crash in the price of crude oil, Nigeria as well as other OPEC member countries have lost about $1 trillion since the crash, in terms of deferred projects and outright cancellations across the supply chain, upstream, midstream, downstream. Also speaking, Kachikwu commended Barkindo for the giant strides he had taken at OPEC since his assumption of office, stating that in the past, OPEC had lost its credibility, but Barkindo had helped restored it. - Vanguard.